Polyvinyl chloride, also called Polychloroethene or PVC, is a thermoplastic. It turns soft when heated and hard when cooled. Polyvinyl chloride is made by polymerization of the monomer vinyl chloride (chloroethene) CH2=CHCl. PVC can be made softer and more flexible by adding plasticizers. Phthalates are often used to soften PVC in this way. Vinyl polymers are the most common type of plastic. In popular usage, "vinyl" refers mostly to PVC, but there are two other vinyl polymers which are more common. The most common is polyethylene, the second-most common is polypropylene. Another, less used, is polystyrene. Softened PVC is used in clothing, upholstery, electrical cable insulation, and other products instead of rubber. In the 1950s PVC became the usual material of phonograph records. About half of the polyvinyl chloride resin manufactured each year is used to make pipes. PVC pipes are 66% of the newer water pipes in the US. PVC pipes are 75% of new sewer pipes. PVC is useful because of its light weight, high strength, and low reactivity. Also, PVC pipes can be glued together, or they can be connected by heating (similar to joining HDPE pipe). Both kinds of connections make permanent joints that do not leak. PVC plastics can be recycled. Their recycling code is "3". ↑ Titow W.V. (31 December 1984). PVC technology. Springer. pp. 6–. ISBN 978-0-85334-249-6. Retrieved 6 October 2011. ↑ Shah Rahman (19–20 June 2007). 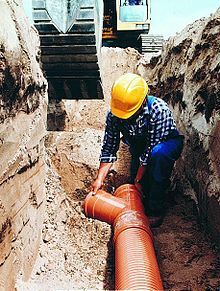 "PVC Pipe & Fittings: Underground Solutions for Water and Sewer Systems in North America" (PDF). 2nd Brazilian PVC Congress, São Paulo, Brazil. http://www.institutodopvc.org/congresso2/ShahRahman.pdf. This page was last changed on 24 December 2018, at 22:49.